The CWRTGB Book Award announcement, for books published in 2014, was made at the Holiday Banquet by Larry Plymire, Chairman of the Book Committee. The recipient is Eric Wittenberg for his book The Devil’s to Pay, John Buford at Gettysburg. 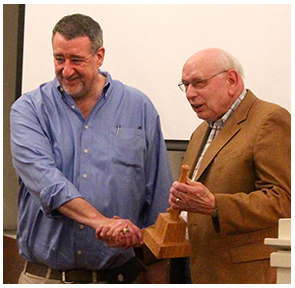 Eric Wittenberg (LEFT) is presented with the 2015 Gettysburg CWRT Book Award by Larry Plymire, Chairman of the Book Committee. 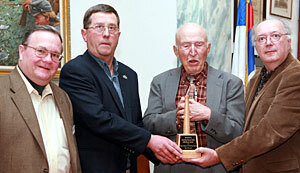 The award was presented to Wittenberg at the March 2016 Roundtable meeting. The Civil War Round Table of Gettysburg, PA is proud to announce that the winner of its annual Book Award is US Army Lt. Col. (ret) William D. Hewitt for his book, The Campaign of Gettysburg: Command Decisions. Col. Hewitt is member of our Round Table, a Seasonal Ranger at Gettysburg National Military Park and a member of the Gettysburg Area School District Board. Col. Hewitt has spent most of his adult life as a student of military matters and in this book he challenges some of the long-held assumptions about why the Battle of Gettysburg was fought where it was fought and why the commanders made the decisions they made. The expertise gained during Col. Hewitt’s career as a military professional has resulted in a book that uses the commander’s education, experience and certain military “truisms” as a method to explain their decisions. In all, Col. Hewitt has added a much needed professional analysis of military planning and decision making to the literature on the Battle of Gettysburg. The book was published by Thomas Publications in Gettysburg, PA in 2012. 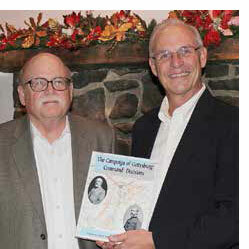 Bill Hewitt (left) is pictured with Roger Heller who is holding a copy of Hewitt’s award-winning book. Pictured above, left to right, are John Winkelman, author Steve French, eminent historian Ed Bearss, and Dr. Dave Collins, who chairs the book committee. 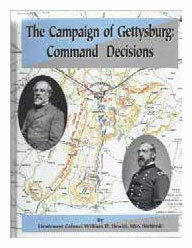 The 2009 Gettysburg Book Award was awarded at the CWRT Meeting on February 25, 2010 to author Steve French for his book, Imboden’s Command in the Gettysburg Campaign. This is an annual award presented by the Gettysburg Civil War Roundtable for a new published history contributing to a better understanding of some facet of the 1863 Gettysburg Campaign, Lincoln’s Gettysburg Address, the battlefield at Gettysburg, and the memorialization of the battlefield. French is a history teacher from West Virginia. In this text he examines the role of Brigadier General John D. Imboden, commander of one of Robert E. Lee’s cavalry brigades. Imboden was tasked to use his Virginia troopers in the Shenandoah Valley to destroy railroad tracks and bridges and harass Federal troops. The Northwestern Virginia Brigade, as Imboden’s command was known, was not directly involved in the battle at Gettysburg. But they had a key role of protecting the rear of the army. Imboden reached Chambersburg on July 1, 1863, where they relieved Pickett’s Division. When Lee retreated, they assumed the crucial mission of guarding the trains and the wounded, doing so under trying circumstances. Honorable mention is being accorded to Sue Boardman and Kathryn Porch for their book: The Battle of Gettysburg Cyclorama: A History and Guide. It explains the huge 1884 oil painting by Paul Philippoteaux, how it was displayed through the years, with a guide to the terrain depicted thereon.